I wanted to share some fun events coming up with you very soon. It seems that time gets away quite fast. I realize I am also sending this to those of you far and near, but I still have news we thought you’d still like to know. Lots of good things happening, but I also need to share a bit of sad news that is breaking our hearts. One of our beloved cats, Bruno, went into liver failure and died early morning on October 22nd. He was rushed to the ER vet that previous Thursday, remained overnight on fluids, and then brought to Dr. Core on Friday morning. Tim and I visited with Bruno on Saturday morning since we knew they would not be open on Sunday. He rallied a bit, then went downhill. He died around 6:30 that morning. Any loss of one of our cats hurts. Bruno really hit me hard. He fought the good fight. Now comes the inevitable huge bill. But, it comes with the territory of what we do and why we keep our population low. On a happy note, the four kittens we were fostering for Port City Cat Rescue, one was actually a kitten I found in my yard and named him, Yardley, are up for adoption. 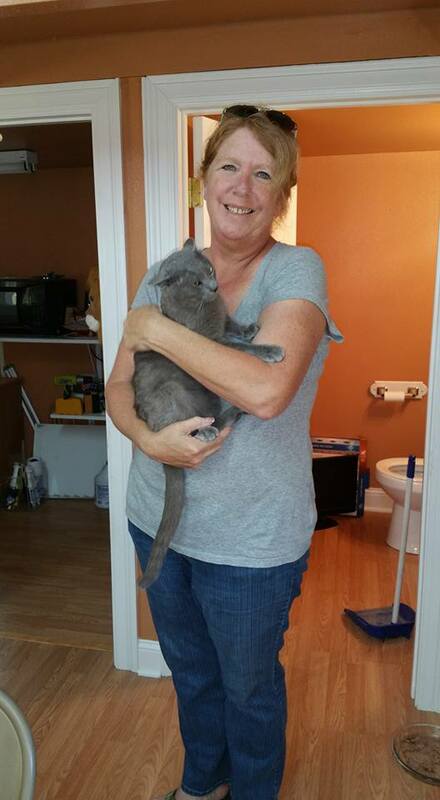 Yardley was adopted within a couple of days, then TruLove got adopted this past Saturday. Midnight and Arlo are at the adoption center at Petsmart on Youree Drive in Shreveport. 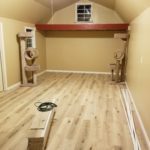 I am still in a boot from my broken ankle, but am well enough to work on the new building to complete the caulking and painting around the trim inside. 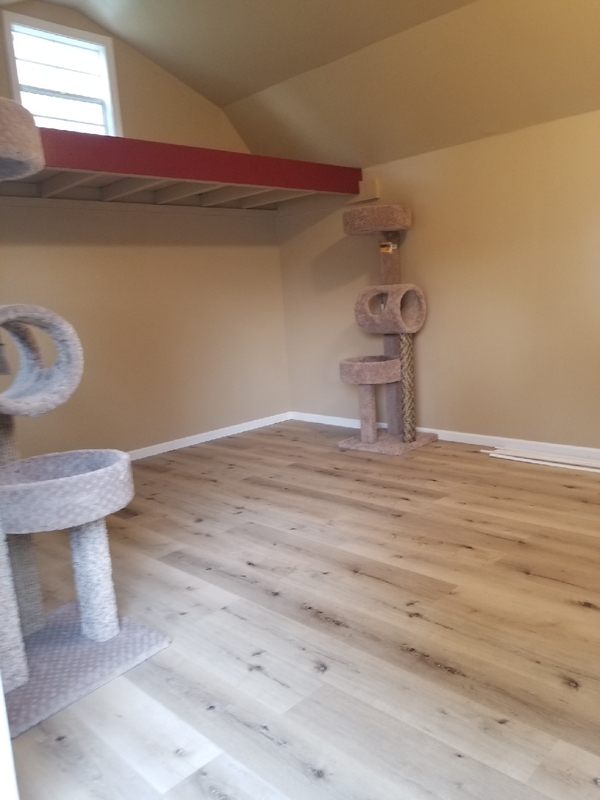 Once I get that done we will move our cats to the new building in our Bossier Parish location. It will make it much easier on those of us who live in Bossier to be around the cats more often. We are still trying to get quotes from contractors about the outdoor catio and concrete. We need to consider what is the best way to go prior to fundraising and grant searching. Tigger is doing very well in Tyler, Texas. Moses is doing well in Branson, Missouri. Tim and I are going to visit Moses very soon. Pics will follow our return. Amazon Smile: From 29 October – 2 Nov, Amazon is 5% of what you purchase to the charity you choose via Smile.Amazon. I haven’t been able to get the name fixed on their site, so there are places that still have a couple of different versions. As long as you find Yogie and Friends in Frierson, Louisiana, that is us. They are trying to fix it for us. It all helps lots. Saturday, 17 November 2018, 7-10a.m. Pancake Breakfast at TaMolly’s 2509 Beene Blvd, Bossier City. Tickets are just $5 each. You will also have the opportunity to add sausage patty and/or eggs to your meal. We will have several cool raffles as well. Yogie and Friends will receive 100% of the funds raised from this. Saturday, 24 November 2018, 2-4p.m. 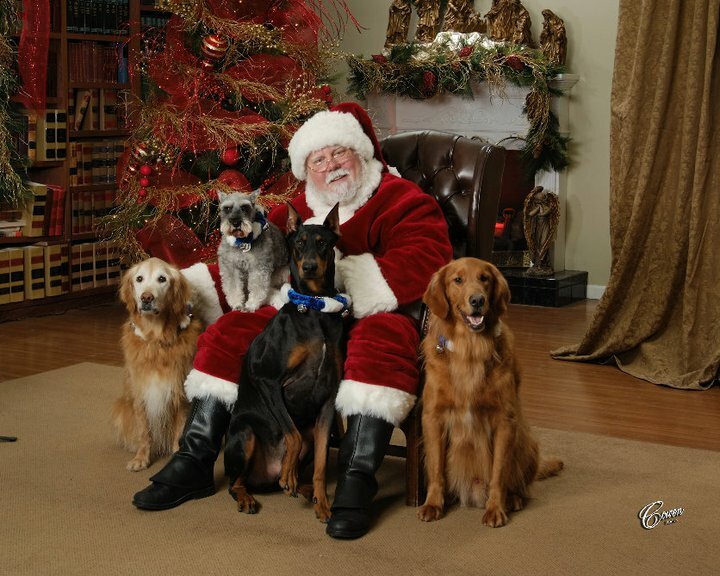 Pet Photos with Santa, Cowen Studios, 4360 Youree Drive, Shreveport. We ask that your pets be properly and safely restrained. This is always a huge showing and lots of fun. Sunday, 2 December 2018, 2-5p.m. Paws in Paradise, Margarittaville Casino, Bossier City. Yogie and Friends will have a booth and raffle items as well. This is another pet friendly event. Saturday, 15 December 2018, 11a.m.-3p.m. Christmas Bake Sale and Fundraiser, Petco, 6596 Youree Drive, Shreveport. Thursday, 20 December 2018, 6 – 10 p.m.
Monday, 24 December 2018, 10a.m. – 6p.m. Please keep us all in your thoughts. We are working hard for these cats and our hearts are really hurting at the loss of Bruno. Our funds took a big hit with our current vet bills. If you are able to help in any way it is greatly appreciated. We really hope to see our friends at one or more of our events. We love catching up with you. If you are on Facebook, please follow our page under Yogie and Friends FIV+ Cat Sanctuary. 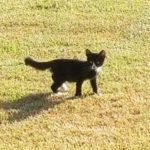 YARDLEY: I recently saw a kitten occasionally coming into my front yard. At first, I thought it could be another animal, but its movement indicated a young cat. When I was able to see it more clearly it was obviously a young kitten. It began to run into my back yard and hangout enough to make it possible for me to feed it and try and get it comfortable. After two weeks I finally used a kitten safe, drop trap, and caught him. He appeared to be around 10 weeks of age, and surprisingly quite healthy. Since he was hanging around my yard I call him, Yardley. 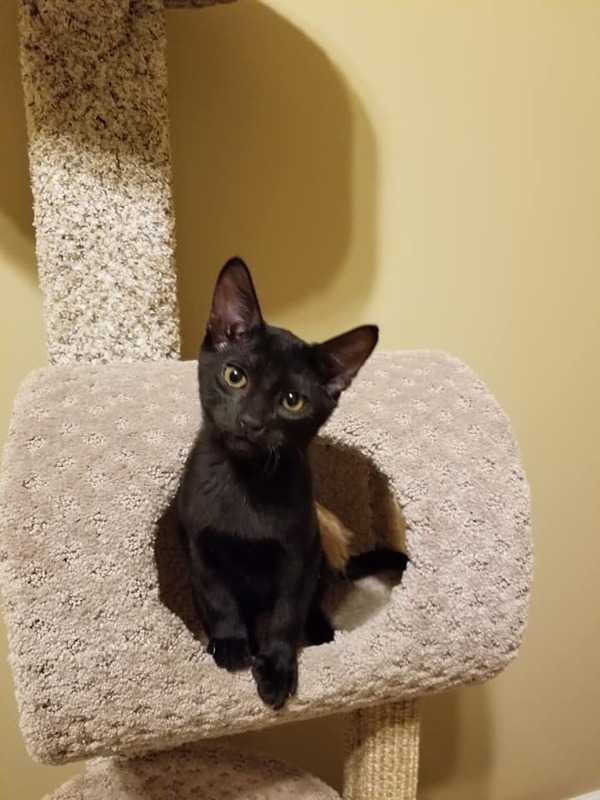 He has had his first set of kitten shots and is now ready to be placed up for adoption through our friends at Port City Cat Rescue (PCCR). TIGGER AND MOSES: Due to a change in ownership of the facility we moved our big cats to back in December 2014, our two remaining big cats, Moses the lion, and Tigger the black leopard, have been relocated. We moved Tigger to Tiger Creek in Tyler, Texas on August 1st. Tigger turned 17 in June and he tolerated the move and is adjusting very well to his new home. And as expected, his reaction to Tim was wonderful. He is most bonded with Tim. Moses, who is now 12 years old, went to Branson, Missouri in June and is with some very nice people. Tim went and visited him in July. We will be going back to visit in November. We would have preferred Moses also be in Tyler for our convenience, but it’s all good. SPONSORSHIP: Sponsorship is a very important way to help our animals. 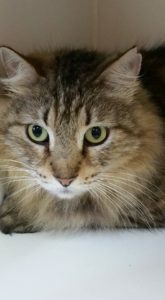 By sponsoring one of the FIV cats you will be providing food, medical care, and their basic care and support. 100% of the sponsorship goes to the care of these animals. If each cat had a regular, monthly, sponsor, it would help ease the burden of care for the animals we provide sanctuary for. Would you please consider sponsoring one of our animals? We really need you. 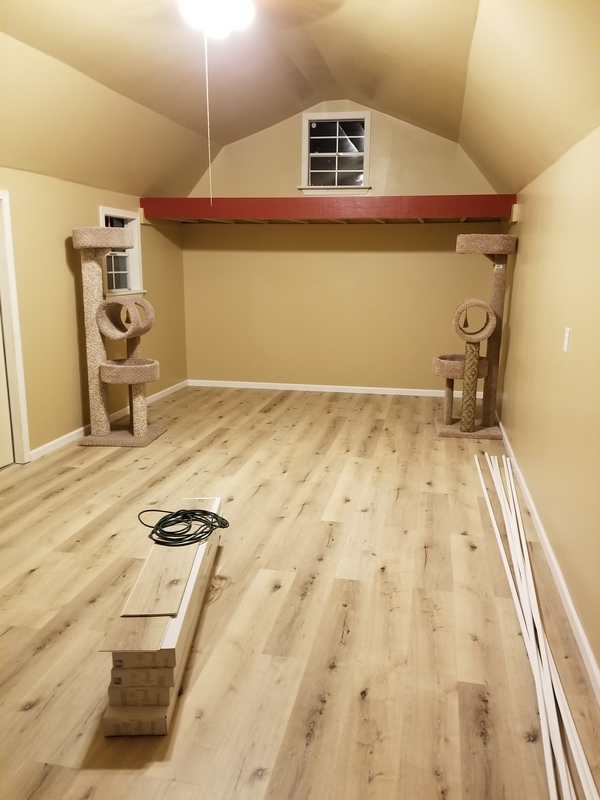 NEW CAT BUILDING: Since the new cat building is just about ready to be used, but not 100% completed, we used it for an opportunity to help foster four kittens, as well as Yardley, for Port City Cat Rescue (PCCR) until they were healthy enough, and old enough, to be placed for adoption. They will be placed up for adoption in the next week or two and are happy to have been able to offer this help to another cat rescue. OLD FACILTY: Our old facility that we had for the lions and tigers has been slowly being cleared out. On September 8th we will do a major clearing, and leveling, of the property to get it into the condition pre-big cat rescue. After we get to that point we will decide on the possible sale of the property and our relocation. We did build our new cat building at a Bossier location in anticipation of this. MY INJURY: I recently missed a step coming out of the catio and ended up breaking my left ankle and damaging the right. 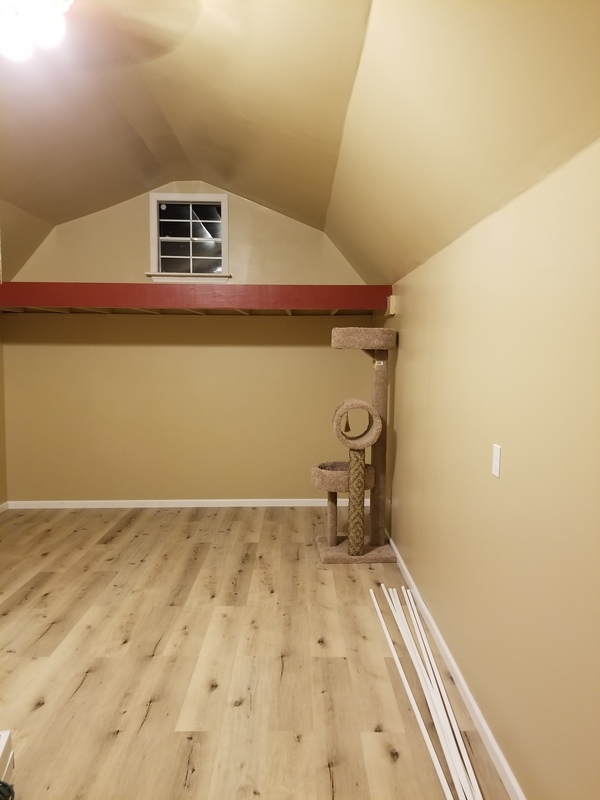 So, as a result it puts me a bit behind on some of the work I will be able to do, such as paint and caulk, and build walkways and loft access, in the new cat building. It will put me about six weeks behind, but it will get completed. CRITICAL NEEDS: We have had some big hits in the vet bills department this past month. We desperately need your help to build the coffers back up to be prepared for any medical emergencies. We also can use Scoopable cat litter, preferable unscented, but we will take any, as well as cat food. We feed Friskies or Fancy Feast canned pate, or Purina Cat Chow complete. We do have some on an expensive urinary tract formula that we have to get at the vet. If you can help with a monetary donation, please do. We really hope you can help us in this area. 17 November 2018 7a.m. – 10a.m. We will receive 100% of the proceeds from this event. Tickets are $5.00 each. Additional options of sausage and eggs for an additional fee. We will also have several raffles at this event. 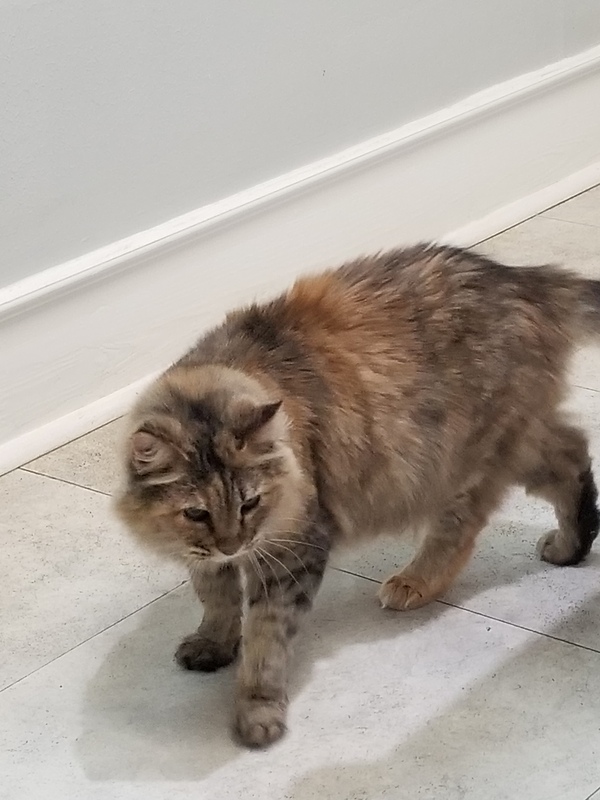 PAISLEY: Paisley, our sweet cat that retested FIV NEGATIVE, but was positive for corona virus and toxoplasmosis, had her follow-up visit with our vet on the 30th. She was examined and given the all clear! Yay! She will always have a stuffy sounding nose. She may have had several untreated upper respiratory infections (URI), but was never treated, and that causes permanent scarring in the nose and sometime sinuses. She has had some improvement, but she isn’t sick. The vet did find a very slight heart murmur, but nothing worrisome. So, she is good until her yearly exam. NEW CAT BUILDING: The new building is looking amazing. 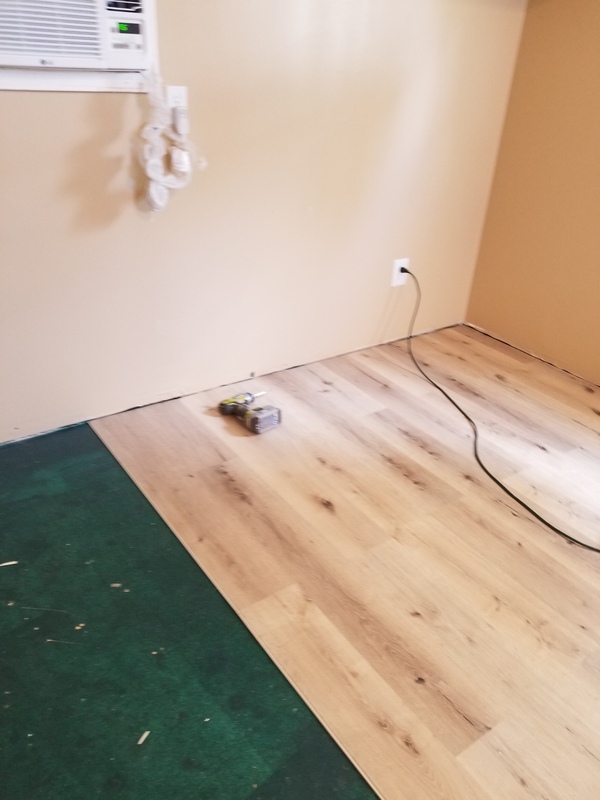 The floor and base boards are in! Now it will need to be caulked and touch up paint for all the trim. We haven’t come up with the loft access yet but have several ideas. 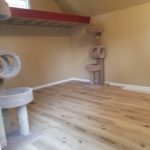 Then we will also do the walkways and all the fun stuff for the cats. We will begin to look at the outdoor catio after that. We are looking for grants and a lot of fundraising since a lot of concrete will be needed. 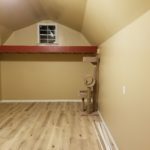 BUT, the house will be used before that is built and the cats can enjoy their new digs! Thank you to everyone who came out to support our Spring Bake Sale. These are always crazy fun for us to have. Caspar: On Friday evening, March 23rd, our solid white cat, Caspar, started throwing up. It was the usual look of a cat throwing up food and we had no reason to be concerned. Except, he continued to intermittently do so and began to pant. Since cats do not normally pant I got very nervous and rushed him to the emergency vet. Within 25 minutes of his first episode Caspar was dead. It was so unexpected and shocking. The vet said he had a slight heart murmur and lots of fluid on his lungs. Some fluid even came out during intubation. That’s a lot of fluid. The sad thing is that he had exhibited absolutely NO signs of illness. He was playing and eating normally that day. The vet suspected Hypertrophic Cardio Myopathy, which is a condition that often does not present any symptoms and the animal is suddenly dead. It has happened to several of our friend’s pets. Caspar was not an FIV/FeLV positive cat. He had been seen by a vet within the past six months and there were no indications of a heart murmur. We are still shocked by all this. There was nothing we could have done, but it still hurts us terribly. Oskar: Oskar, the very injured black cat we helped last month continues to improve and has adjusted well to living inside at the sanctuary. He is very comfortable with us. Give for Good Giving Day: May 1st is the annual, Give for Good giving day. It starts just after midnight on May 1st and runs all day. It’s an opportunity for non-profits all over the country to raise much needed funds for their organization. 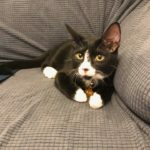 Eat a Dog, Save a Cat: Yogie and Friends will have a cat building fundraiser to help finish the new cat building. We will have our, Eat a (Hot) Dog, Save a Cat, hotdog fundraiser at Petco on Youree drive in Shreveport. This event will run Tuesday, May 1st, from 11a.m.-2:30p.m. You can get a grilled hot dog, chips, and bottle of water, for a donation of $5.95. Kona Ice will also be with us during this time selling their amazing Ice drinks. We will also have our cool Yogie and Friends merchandise as well as several raffles. We hope you will come by and help the cats during this time. New Cat Building: The new cat house has been an unbelievable and frustrating challenge to get completed. 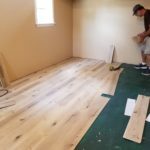 We have found a well-respected, and reputable, building contractor, that came out to look at the building and gave us a price of finishing the inside to include, tape and mud floating, trim and finish work, cat walk shelves and lofts, and any touch ups inside. The cost of materials and labor will be $1650. At this time, we do not have a lot of funds to finish the building and we have created a GoFundMe to help get this building completed. Once that is done and we get more funds, then we will look at doing the outdoor catio. The indoor work is the priority, so we can move the cats in. We have had a challenging beginning to the New Year. Sadly, I lost my father on New Years day. Just one day before his 84th birthday. It was not unexpected, but still a heartbreaking loss. We also lost our beloved African Serval, Speedy, on January 12th. Speedy Gonzales was the first African Serval we had gotten at the sanctuary. He was a fun and interesting cat. Speedy was born on 5 January 2001. He was very silly and playful, and we gave him a great life here at Yogie and Friends. He will be terribly missed. 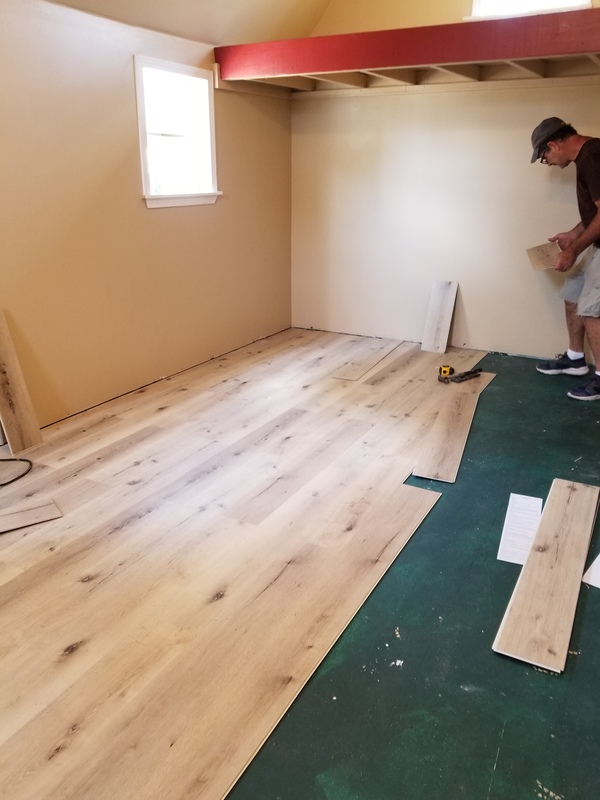 New Cat Building: We had a wonderful drywall installer come by to see our new building and he offered to do the drywall installation for FREE! What an amazing gift. That was on a Sunday and the following Tuesday he had fallen off some scaffolding and shattered his shin and his wrist. He has had two surgeries so far and we are just happy he was not injured much worse. He has a long road to recovery, but we are thankful he will be okay. As a result, we are now searching for another drywall person, who we are hoping, may also do the installation for us for free, or at least for a very reasonable price since we did not raise all the needed funds. We are still working on that. We are doing an inventory of the merchandise from our former gift shop, which has since been turned into a beautiful house for the FIV/FeLV positive cats at the sanctuary. Once that is done we will work on a big sale to reduce the inventory of items we do not sell at our bake sales. Once we do that, then we can focus more on items that do well for us at events. Downsizing this kind of stuff is important. Watch Raffle: We are raffling off his and her watches. Tickets are a donation of $3.00 each and you can purchase them via PayPal at yogieandfriends@hotmail.com Please make sure you select the Friends and Family option so that you are the one who pays the PayPal fees. This ensures we get the entire $3.00. You can also send a check or money order to: Yogie and Friends, 128 Fob Lane, Frierson, LA 71027. Make sure you provide a legible name and good contact phone number. The drawing will be held at 3 p.m. at the spring bake sale on March 24th. Winner need not be present. We can mail the watches to winners outside of the area, but in the United States only. We had an unexpected, and very sad, loss at Yogie and Friends. Our beloved, Kristoff, who had fought a blood infection two months previously, died suddenly on September 25th. He was only two years old and we felt it was important to find the cause of his sudden death. We are still awaiting on necropsy results. On examination, it appears neurological. No matter what the cause we are devastated at this loss. We are so happy that he had been spoiled and pampered and enjoyed as good a life as any cat could. Vet Bills: Because of the emergency vet visit, and the care and surgery to save Kristoff, our coffers have been hit very hard. The ER visit alone was $545. The other vet care to save his life, as well as major surgery on another cat diagnosed with Triaditis (impact on the liver, gallbladder, and pancreas), we paid another $2744. People may think this is harsh to pay so much, and sadly we lost our beloved Kristoff, but we did save another cat. This is what we are about. We save cats. Of course, we will always do what is the most humane thing based on input from our veterinarians, but we will do what we can without reason and without suffering. We could really use your help in building our bank account back up after this hit. Thank You: Thank you to Dottie’s Delights and Flying Heart Brewing for their donations. They selected Yogie and Friends as their charity of choice for the month of August and we thank them for their kindness. Cat Litter: We are currently in desperate need of Scoopable cat litter. We found that the Wal-Mart Special Kitty (40-pound box) to be the best value now and we have been buying that. But, we will take any Scoopable litter right now as we really need it. You can send a monetary donation to us and we will pick up the litter, since shipping it is costly, or contact us for a pickup place. Please help us with this. We need you. New Cat Building: We still need your help in completing the new cat building. The electrical work should be done within the next month and then the insulation and drywall. We would like to get this completed before Christmas. 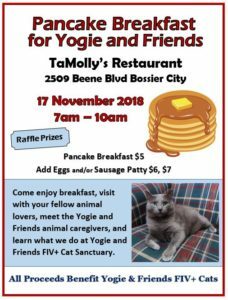 If you can help us make this possible much faster you can donate via PayPal at yogieandfriends@hotmail.com or by mailing a check or money order to: Yogie and Friends, 128 Fob Lane, Frierson, LA 71027. One of the most difficult parts about the kind of rescue we do is loss. We know there will be loss, but hope and pray it is minimal. Death is a fact of life, but we always hope that the care we provide these animals will give them a longer life than they might have had otherwise. And, I must report yet another loss. One of our Feline Leukemia positive cats, Splotchie died suddenly on March 14th. This was a total shock since she had exhibited absolutely no signs of illness. Yes, she was FeLV positive, but she had been eating well, drinking water, and doing surprisingly well. The problem with FeLV versus the FIV is that the leukemia cats seem to develop more cancers. Many don’t live as long either. Splotchie was approximately ten years old, which is good, but not long enough for our liking. She developed cancer. But, she had no obvious signs of illness and she died peacefully in her sleep. We are really going to miss this sweet girl. R.I.P. Splotchie. Our sweet boy, Bert, had his splint removed on March 8th and he is doing very well. He was a little apprehensive about using the leg for the first few days, but that is normal. Even for us. He is now back to running around and playing like crazy. Other than his leg looking thin from muscle atrophy, which has improved daily, you would never have known he had a broken leg. We planned to bring in two new residents, but brought three in instead. 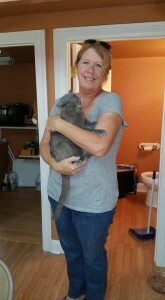 Ursula and Sam came to us from a humane society in Pineville, Louisiana that we have worked with in the past. It’s where Bruno came from. 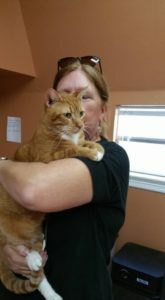 Then we received a frantic email from a volunteer at a high kill pound in in La Place, Louisiana, about a very sweet, young, male cat that was returned to the shelter for some reason, but when he was returned he ended up testing positive for FIV, which he didn’t have before being adopted. He only had a day to live, so we agreed to take him. When we brought Huey in from La Place he immediately bonded with our VP and she ended up taking him home. 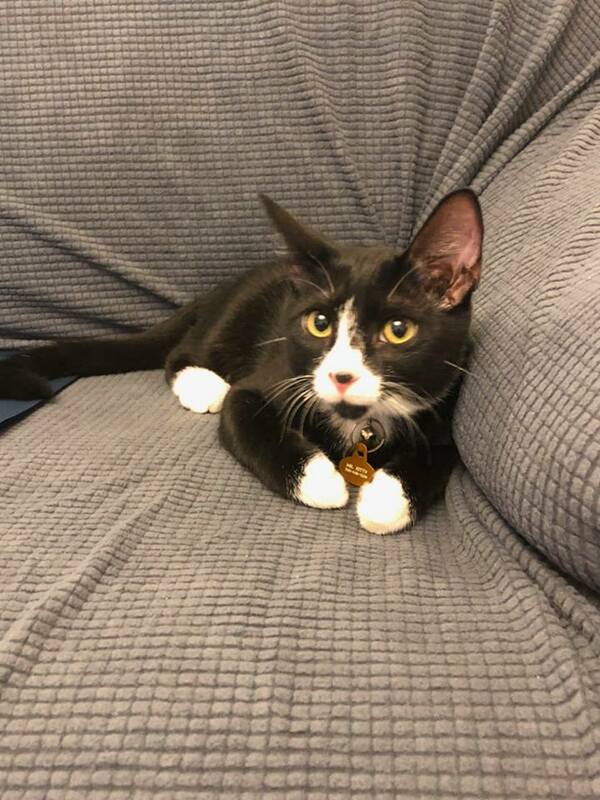 He is now known as, Nimitz, and we are very happy for him. All three of these cats are FIV positive, but are doing very well. Ursula is extremely shy and we are spending a lot of time helping her adjust. Sam is young and acts like he has been with us all his life. He is very social. Nimitz, well, his bonding speaks for itself. As a result, we are now back at capacity. Spring Bake Sale: Our Spring Bake Sale had to be rescheduled due to work schedules and other conflicts. We moved it to April 8th and the time (11a.m.-4p.m.) at Petco, remain the same. Comic Con: The prep work for the upcoming Comic Con is underway since this is a two-day event. We have new merchandise that we think our fans will like and hope will buy to help the animals. This event is going to be held at the Hirsch Coliseum in Shreveport on April 22nd and 23rd and we are very excited about this. This gives us an opportunity to share and spread the word about our new mission and to help educate the public about these cats and what FIV and FeLV are. We hope our fans will stop by our booth at the Con. Fosters: Many times there is a need for good fosters to help with cats and kittens while they are healing from a spay/neuter, may have had a litter of kittens and need to wait until they are weaned, or some other cat/kitten emergency. 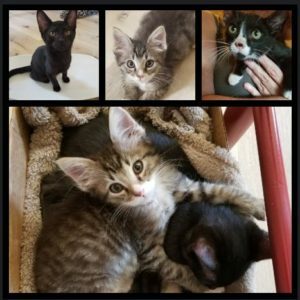 Right now we have a Yogie board member who is fostering several cats and kittens that will be placed for adoption through Port City Cat Rescue. Since we are not set up for adoptions at local pet stores or events, and most often we don’t have adoptable cats, we work with them. If fostering is something you are able to do, then please consider making yourself available. We can certainly use your help and save more cats. We begin with yet another sad announcement. 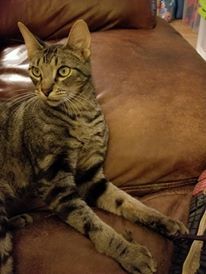 Our sweet and loving boy, Pippin, has died on September 20th.We were asked by Paws4Life, a volunteer group that works with Caddo Animal Control, if we could take this young kitten since he tested positive for feline leukemia. He arrived at Yogie and Friends in July, but he never thrived physically. He never got above 5.1 pounds and his young body just could not fight this virus. It is a devastating virus for young cats and kittens and they often don’t make it past 2 years old. We always dread the diagnosis of FeLV much more so than FIV. The vet also suspected he had another deadly illness called Feline Infectious Peritonitis (FIP) and he was slightly jaundiced showing he had liver issues. Pippin was especially hard on me personally since I did everything I could to help him gain weight and feel better. He fought the good fight and we will miss him. R.I.P. Pippin. New Cats: We want to introduce three new residents to the sanctuary. Alex: Alex is a young, orange tabby that was in the local pound for several months. He was pending adoption until he tested positive with F.I.V. and at that point we knew he would be euthanized and could not allow that to happen. He is currently on steroids for some skin issues that are not chronic. We estimate he is 2 years old or younger. He is very sweet. Splotchie: Splotchie is a gorgeous white and black female with a unique half mustache on her face. 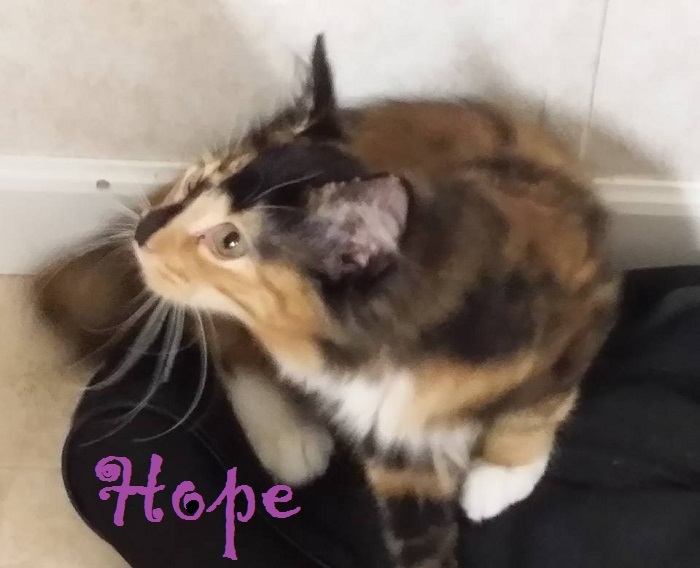 She is FeLV positive, but is not a young kitten and hope she does well. 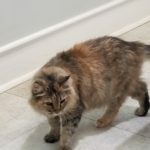 She is extremely shy and a little slower to adjust to being with us, but her human that asked us to take her visits her twice a week, would be more if she could, and we are hoping she will soon adjust as the others have. It’s an adjustment for any cat. 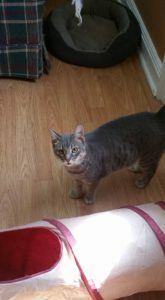 Little Billy: Little Billy is a gentle, gray tabby, whose owner had to go into a nursing home and when Billy tested positive for FIV the neighbor caring for him could not take him into her home. 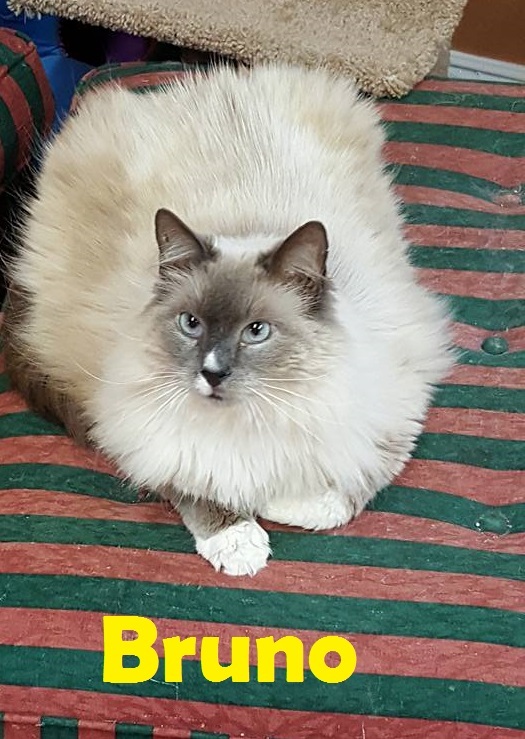 He is currently in our quarantine and will join the other cats in the FIV house. Paws in Paradise: Paws in Paradise is a pet adoption/awareness event hosted by Margaritaville Casino in Bossier City, Louisiana. It will be held this coming Sunday, October 2nd from 2-6p.m. inside the Casino theater. This is an awesome event the casino puts on for animals. Dr. Jaimie Wise and her staff from Wise Choice Animal Clinic will be there to do microchipping for only $20 per pet. She has also donated two microchips for Yogie and Friends to raffle off during the event. 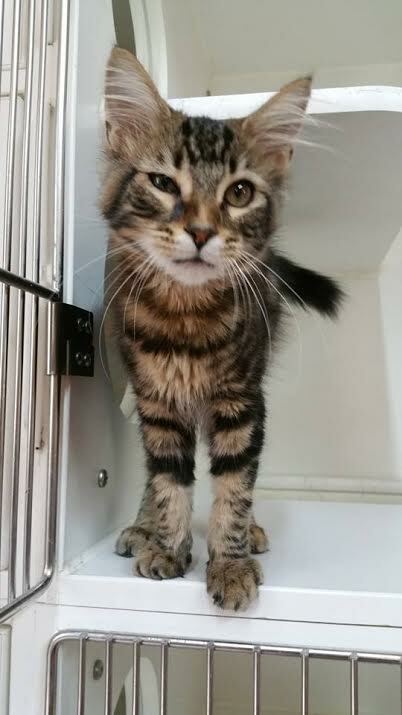 Adoptable Cats/Kittens: The kittens that we pulled from the local animal pound are thriving. We had a few scares with them, but they have a clean bill of health from our veterinarian. They had their first vaccinations on the 28th of September and are doing well. We refer to them as the Six Pack. There are four boys and two girls. They should be available for adoption soon. Volunteers: We really need dedicated volunteers. Volunteering at Yogie and Friends does have its rewards. You get to cuddle with some great cats. You get to meet great people with a similar love for cats and for what we are doing. And we will feed you! Lol! But really, it’s a good feeling and the work is not that difficult. Yes, we will have some very labor intensive jobs as we repurpose the property to safely accommodate domestic cats and yes, there is lawn work, but that’s not all that is needed. We need volunteers who will scoop litter boxes, sweep and mop floors, clean counter tops and work spaces, poop scoop the outdoor cat play areas, and other basic cleaning needs. We also have cats need to be loved and socialized. We hope you will consider helping us make our mission a successful one. Please volunteer with us and help us make life a little nicer for these special cats. You can contact us via email at yogieandfriends@hotmail.com and our volunteer coordinator will call you as soon as possible. We can certainly tell it is summer here in the south. We have been experiencing temps up to 109 degrees in the shade and as high as 120 degrees in the sun. These are very dangerous temperatures and we hope you will take precautions for you and your pets. LOUISIANA AND TEXAS KROGER SHOPPERS!! 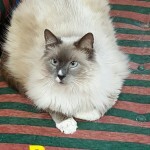 Today, 1 August 2015, is the day to get your Kroger Community Rewards linked to your Kroger Plus Card to help the FIV and other special needs cats at Yogie and Friends Cat Sanctuary. If you link your Kroger card to our rescue via their Kroger Community Rewards program you need to relink it beginning today!! Once linked, every time you shop and swipe your card the Yogie cats will benefit! Here is the link to enroll or sign in (if you are already enrolled). Choose us as your charity of choice… NPO #80724, Yogie and Friends Exotic Cat Sanctuary (we will be fixing the name later, but it’s still all good). Website Under Construction: There are many changes taking place at Yogie and Friends Cat Sanctuary. One change is our website. Our awesome webmaster is making changes based on our update in mission and structure. We ask that you please be patient while these changes are taking place. You will love the changes and additions as they come along. We are still a 501(c)(3) in good standing. We STILL support our big cats that are in boarding up in Oklahoma, and we are STILL doing a lot for the little cats. We are currently the only cat sanctuary in North Louisiana. We are helping with cats that others would just euthanize. These special needs cats need us and there is no reason to kill them just because they have FIV or any other virus. We will explain more about these viruses that effect domestic cats as we move along. For now we are trying to update, change, adjust, and whatever is needed as time permits. Our focus is on the animals and we appreciate our fans. Frazier is a young, Russian Blue looking, male. 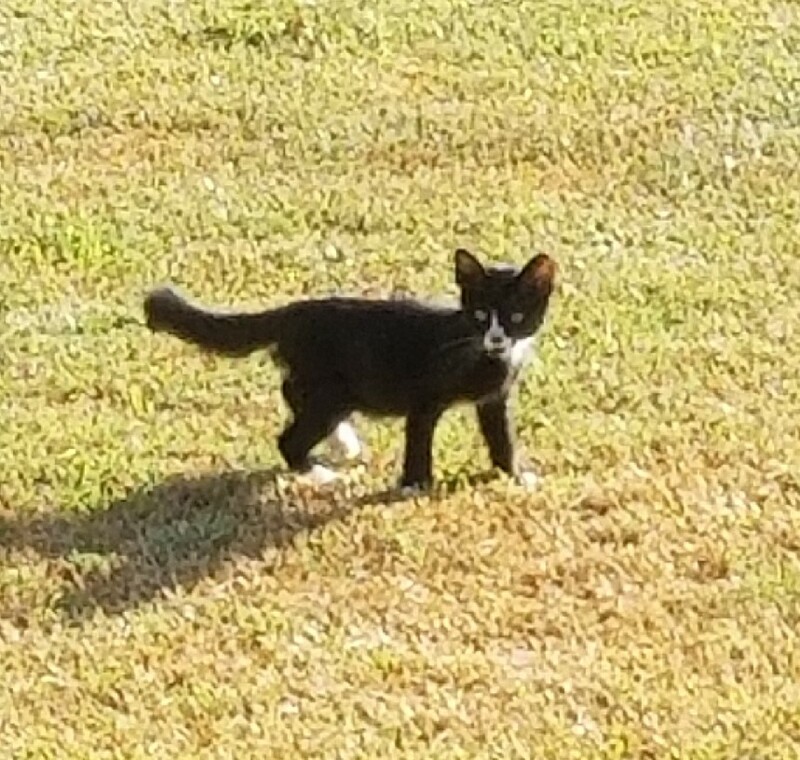 He was a feral found and cared for by some very nice people in the neighborhood he was roaming. 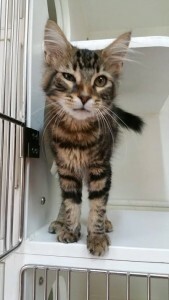 They had contacted a local rescue who promised to take him and get him adopted until he tested positive for FIV. 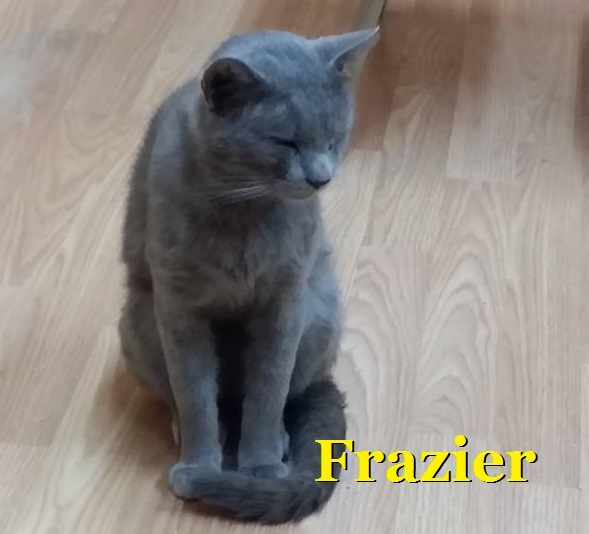 They were told they should euthanize Frazier and they disagreed and contacted us at Yogie and Friends. Frazier is now living the life with us at the sanctuary. He, like all the FIV cats, is available for adoption. He’s a little shy, but very sweet and loving. Welcome to Yogie and Friends Frazier! Another special cat awaiting intake. 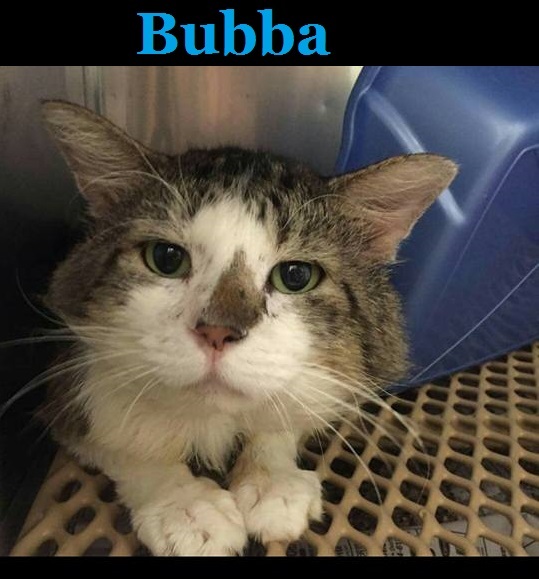 Bubba is another FIV positive cat currently being housed at Bossier Animal Hospital. Bubba is 3 years old and on hold with Dr. Snyder awaiting vetting. He is not neutered yet, but once he is he will be coming to us at Yogie and Friends Cat Sanctuary. He has a lot of swelling on his face from fighting with other cats. This is a common issue amongst unaltered feral cats. Fighting is also the way FIV is often spread. We look forward to providing Bubba a safe, permanent home with us at Yogie and Friends. Circumstances Beyond Control: Sometimes we know there are circumstances beyond the control that cause pets to be left in dire circumstances. Things such as the death of an owner, an owner being placed in nursing homes, or financial situations causing an owner to give up a beloved pet, is not the fault of the pet. A recent death has left four cats needing a home. This is one of those circumstances beyond the control of these cats. They are sad, confused, and missing their human. We are taking the four cats in order to keep them all together. Sadly, people are mostly looking for kittens and don’t often consider that an older cat can make an excellent addition to their home. We are providing them this opportunity to stay together and hopefully make things as comfortable as possible for them. Wish List: As always, cash is king. We still have bills to pay. We have electric, water, veterinarian, and some construction bills. 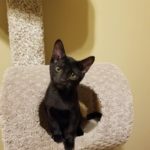 Some items we need are: Revolution for cats, cat food (currently we use 4 Health Grain Free and Friskies canned), cat litter (mostly Tidy Cat without Glade scented), and toys and treats. Cash is always easier since we can buy items at a rescue discount. Our tiniest of our furballs, Hope, has graduated on her vaccinations. She is growing and thriving and we are just waiting for her to be old enough to spay. We will also have her retested for FIV and our hope is that she tests negative and only showed FIV as a result of her mother’s antibodies. Paw and claws crossed! These cats are all sweet and loving and we are more than happy to give them this opportunity to live out their lives in peace and comfort. We are hoping that our volunteers will give them the love and attention they so richly deserve. The building is being set up like a living room to give a natural feel of home for these cats. Volunteers can just hang out with them. It’s all good for us and the cats. We gain so much from them. Volunteer Needs: We need your volunteer help. Volunteering can be as simple as spending quality time with our special needs cats, loving them, and socializing them. Basically just spending time with them. The FIV cat house is setup much like any living room in a house. We are doing this so that our volunteers can sit and read, watch a movie, etc., all the while allowing a cat time in your lap and just being loved on. This will allow these cats a chance to see what it’s like to have love and attention. We also need help with cleaning litter boxes, lawn maintenance, cleaning the building, fundraising, building outdoor catios, and more. If you are interested please let us know. Support a Special Needs Cat: FIV (Feline Immunodeficiency Virus) is a feline only, slow-acting virus. It is so slow to progress that most FIV+ cats die of old age. Once thought to be deadly and highly contagious, it has since been found to be neither. Just as HIV was once believed to be a death sentence for those afflicted, so it is still with FIV. Only in the case of cats, the mere diagnosis produces that death sentence. Fortunately there are many veterinarians who don’t believe that this is the case and this is why we got four FIV cats. We got them from veterinarians who did not want to kill them. We do NOT want these cats to die just because of this diagnosis either. They deserve the chance to live. And live they will with us. Now that we have our first FIV positive cats living comfortably in their new home at Yogie and Friends, they will need your support. By sponsoring one of the FIV cats you will be providing food, medical care, and their basic care and support. 100% of the sponsorship goes to the care of these animals. None of the Yogie volunteer staff receives ANY compensation for the work we do. Our Big Cats: Putty Tat and Gomez, two of our beloved tigers, now have a much larger habitat and they are thrilled. It looks almost like Putty Tat was smiling when he was moved. At a cost of $8500 we think it was well worth it. We are raising the funds to reimburse for this new habitat and appreciate any and all help our fans can provide. You will see in the pics just how nice the new digs are. We will post a gofundme link to help with this. 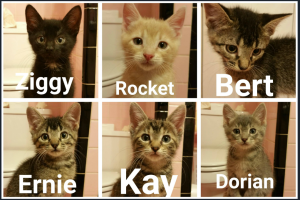 Adoptable Cats/Kittens: We still have several kittens in foster care that we can use your help with. Many have already been spayed/neutered and are current on vaccinations. 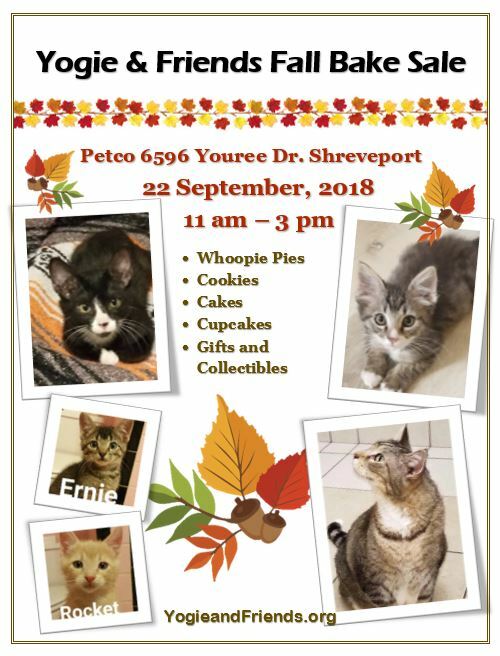 Some of these adoptable cats/kittens will be available at Unleashed Premium Pets and Supplies on Benton Road in Bossier City, Louisiana. This way we can ensure they are going to good homes. We have an Amazon Wish List with a list of much needed supplies for these kittens. Amazon: If you shop via Amazon.com you select Yogie and Friends as your charity of choice. They will donate a percentage of the sales to us. It’s a very easy way to help. Combined Federal Campaign (CFC): CFC is in full swing right now, so if you are a Military member or Federal Employee we hope you will donate to Yogie and Friends via CFC. 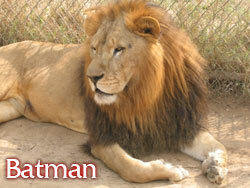 This program is easy and another good way to give financial assistance to the big cats. We hope you will please consider Yogie and Friends when making your CFC contribution. Our CFC number is 42427. Recycle Ink Cartridges and Cell Phones: Please consider helping us with our recycling program. Please don’t throw those old ink jet/laser jet cartridges in the trash. Give them to us. We recycle them and get cash for the cats. You can box up the cartridges; put a prepaid label on it that we will provide you, and then drop it off at any UPS shipping facility or they can pick it up at your business. If you need labels, then just contact us and we will get some to you. The Yogie and Friends Gang!